Are you one of the members of SAP Community who “lost” your content and reputation because you had to get a new account when you changed jobs, or because of some other reason? It can be frustrating when you feel you have to “start from scratch” with a new account and don’t have a good way to show other members that you’ve been part of the community for a long time already. Enter our new profile linking capability, which we just rolled out. 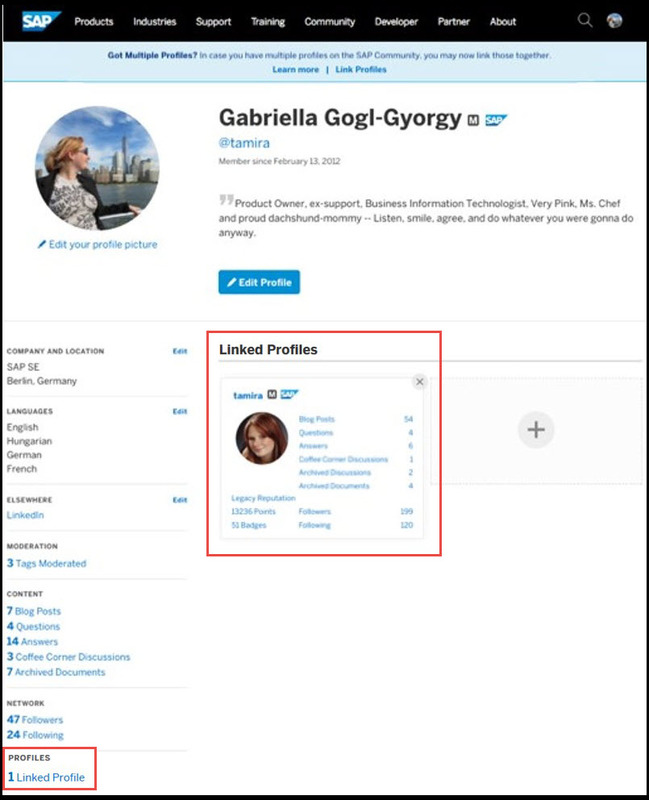 In this way, if you have multiple accounts from various relationships with SAP, you can display the accumulated profiles together, letting others see that you are indeed experienced and not a newbie in the community. This also allows other members who used to follow you to more easily find your new profile and re-follow you, so they won’t miss any new content you publish. Does profile linking unify the accounts? It’s important to understand that profile linking does not combine the linked accounts in any way or consolidate the content list or the reputation or followers. The content lists, reputation, and social graph of each account and profile remain separate, although they are displayed together. Profile linking also does not make it possible to log into your inactive accounts to create more content or acquire additional reputation in those accounts. How do I link my profiles together? If you forgot the password for the second account, as long as that account is still active, you can reset the password via this link or by clicking “Forgot Password” on any log on screen. If the account is no longer active, you can fill out this contact form or send an email to sapnetwork@sap.com to request guidance. 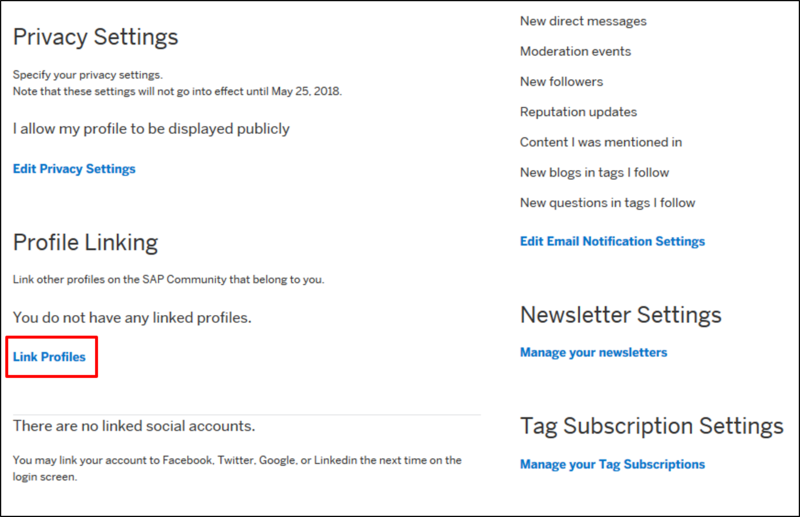 Log into the SAP Community using your current, active account. Select “Former Member” in the dropdown menu in the header.. 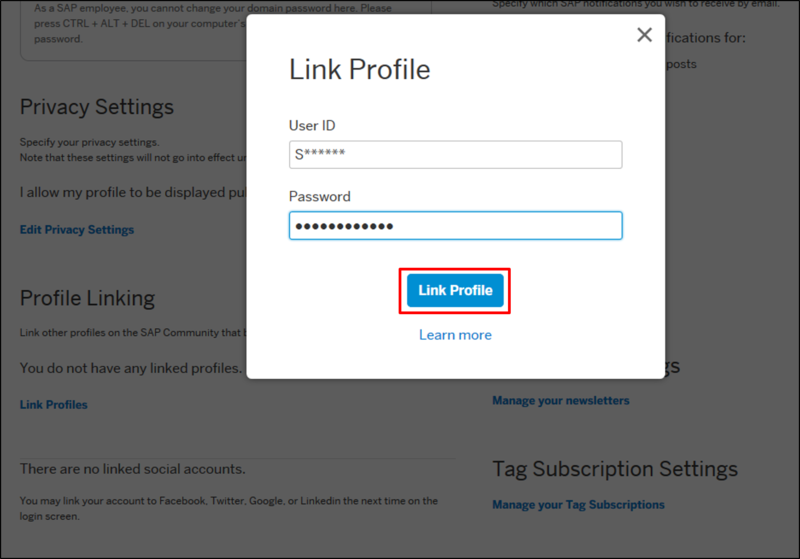 Enter the user ID of the second account, along with the password, in the fields provided, then click the “Link Profile” button. The two profiles are now linked together. What kind of account profiles can I link? 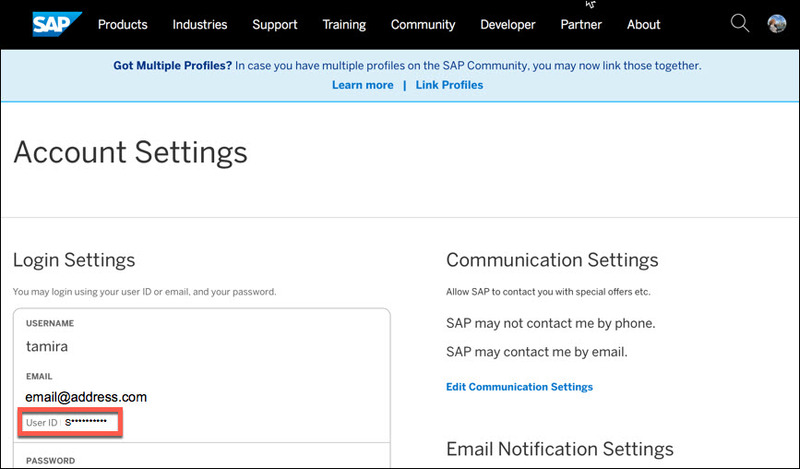 You can link profiles for all types of SAP accounts (P users, S users, C users, I users, and D users). You can even link profiles from inactive accounts to your current account if you still know the password for the inactive account. I forgot the password for my old account. What can I do? If the old account is still active, you can reset the password yourself via this link or by clicking “Forgot Password” on any log on screen. Once the password has been reset, you should be able to link the profile from that old account to the profile of your current account. If the old account is not active (meaning you cannot reset the password), you can fill out this contact form or send an email to sapnetwork@sap.com to request guidance. Is profile linking reversible? What happens if I change my mind? Yes. To unlink a profile that was previously linked, simply click on the “x” in the top right corner of the profile snapshot for that account in your current, active profile. Does profile linking change the status of the accounts associated with the profiles? No, accounts are not changed when you link their profiles. If you were able to log on using your current, active account prior to linking profiles, nothing changes; you can log on with it afterwards too. If you were not able to log on using an inactive account before you linked its profile to your active profile, this also doesn’t change: you will not be able to log on with it after linking, either. Ready to link your profiles? We are excited that there is finally a way for community members to show everyone a fuller picture of themselves. This is a good step in the right direction, and hopefully will help those who feel they “lost” reputation when they changed accounts. 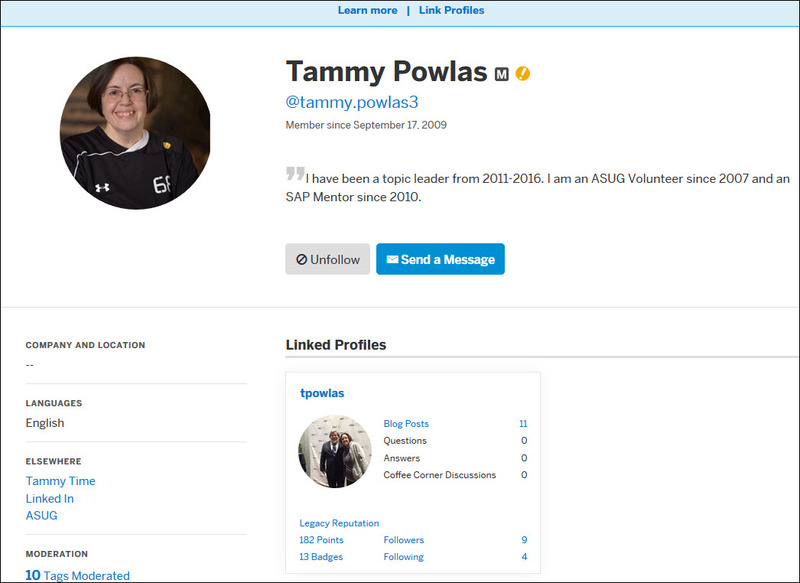 With profile linking, you can now effectively “regain” that reputation and show other members a fuller picture of “you at SAP.” Just like Tammy! Nice! Thanks for sharing Audrey! It’s a great improvement and for sure will make many community members happy for being able to share their old content in their current profile. Thanks to the team! As a hint to anyone who might feel the urge to fill in the “contact form” in the link above, and ask about getting the password to your old account. Do not bother. I got a response back quite quickly, they have no idea about any of this. Apologies, there was some confusion between teams that has now been straightened out. All support requests around profile linking will be reprocessed. PS And no, not avoiding your and other questions/comments below. Definitely hearing you and working on identifying the right person to respond. Thanks for your patience. I will keep beavering away at this, and no doubt eventually I will “link” my two accounts. Some people have dozens, as I understand it. Regardless this is not a “fix” to the problem, it is a band-aid on a severed limb. The problem is that SCN accounts were not linked to the person, but rather to the work related “S” number, which obviously could change – when you changed companies, and even (in my case) when i did not change companies but rather negotiated a new deal with SAP. As has been said many times before, having the “social” SCN account linked to the work related SAP support portal where you register objects and developers in your systems is obvious madness, as is the mechanism whereby when you try to log into the SAP support portal your “P” identity is used first as an authentication mechanism, when obviously that will not work. That is somewhat akin to having the month default to 13, and then the application that defaulted that value complaining about it. My online bank account does something very similar, as do websites that default your date of birth to today. I wonder what the primary key of the SAP identity is – my bet is that it contains the email address, which is why once you set up an account, you cannot change your email address. If it is in fact part of the primary key that would be a very strange design decision. I will let you know how I go combining the accounts! When my first account died someone from SAP put me on the list to have my accounts merged, but even then I did not really believe it would ever happen. i got a response from SERVICE@SAP.COM last night. What I had asked them was the password to be old “S” account which i told them was inactive. I then included a link to this blog and explained what i was trying to achieve. The response was that my old account was inactive, and if i wanted a new S number I should ask my boss. It is just like logging a call with OSS! The person on the other end does not read anything you write, and just responds with a stock answer. Today i will try the other email address mentioned above, just for laughs. I notice on the first day of TECHEd Las Vegas that SAP had bought an identity management company. That reminds me of when i was at university in London and me and my mate were walking past the “Health and Beauty” shop and he wanted to go in. I asked why and he said “I desperately need to buy both”. In the same way i can see why SAP might want to buy an identity management company, as what they are using at the moment for the so called “1DX” experience clearly does not work for toffee. I understand you need to know the password, however we do not know what that was or currently is. I know you do not want it reactivated but if you need to get a password for the old S user ID then you will need to do a password reset for your account and therefore the account will need to be reactivated for this process. If you need to go down this route you need to contact the service market place as they Handel all S user accounts. In other words my prediction about being passed from pillar to post was correct. on other other words, this profile linking thing cannot be done if you have forgotten a password you have not used for several years. As it is not a proper profile linking anyway, and I have only about 30 years left before I die of old age, and there are probably about ten more SAP departments to work through, each passing me on to the next, i think i will give up at this point. thanks for goiing down that road and letting us know how things (don’t) work out! I responded on your first post but should probably respond here too. We’ve taken steps to ensure the confusion between teams is resolved, so hopefully the sort of response you describe should no longer happen. It’s my understanding a team member reached out to you to assist directly, as well. Let us know if there is still an issue remaining for you. Gabi sent me a direct message and linked my two accounts for me, and I am very grateful to her – and you – for helping me directly. In an ironic twist, this morning I got a new raft of emails from various SAP departments (e.g. service@sap.com) saying such a thing was impossible. Still all is well that ends well – for me. I imagine I am not the only one who cannot remember the password do a dead S account though, so i would be very interested to hear how other people go navigating the SAP user identity maze. As a human being I am never satisfied, as Steve Earle sang, so next i would like to know if somewhere on the SCN “burn list” is letting people correct their email address on their account? Currently if someone wants to change their email from hotmail to Yahoo or something, they have to set up a new P number account. That’s a good question, but it’s one that’s much bigger than an SAP Community question, so it’s not one that I have an answer for, unfortunately. I’m not sure why everyone (except Paul Hardy – I’m with you here!) is so excited about it – couldn’t I do something quite simmilar in the past already by just adding “ELSEWHERE”-links to my other profiles?! Even without the need of knowing or reseting the passwords. To my mind the primary user account has to be P-account (with e-mail for this P-account and the user can change this e-mail). Also the user in his user profile can add number of S-ID’s (providing password for S-ID). One S-ID has to be selected as default S-ID (user can change default). Unused S-ID’s can be deleted by user. When user is login to Community only P-account is used. When he tries to open some restricted link (ex. SAP note) then default S-ID from user profile will be checked. The system will create a new P-account (will ask user to provide e-mail for this new account etc.) The new P-account will be linked to S-ID. In the database tables S-ID will be replaced by P-account for all historical data. Also merge of different P-accounts has to be implemented. <sigh> Do I have to say something negative? Not really – I’ll just say I agree with Paul Hardy , Joachim Rees, and Vadim Kalinin. But I’m thinking too much – thank you for the move forward. Knowing that you can’t fix the problem helps. That’s bad news, but better than saying give us time we can get this working. I didn’t see that outright in this blog but I assumed it. Sorry – I did say something not nice. Anyway good try and nice start. Thank you – I can see that forward movement is being made on the things “we” the community have asked for. Perhaps I demand too much. I may eventual like my 5+ profile. Just not worth the time right now. Needless to say that my submitted idea (https://influence.sap.com/sap/ino/#/idea/137848) is still “under review”. Well.. This is a very good improvement but I was expecting a little bit more of this feature but the name is good: It’s a profile link and not a merge. Audrey Stevenson could you please help me with something? When I visit accounts.sap.com I have 2 S-users and 1 P-user associated with the same e-mail. Should I link the accounts just once of would I need to link once for each user inside it? Well… In the end, if you ask a question or write a blog post, you cannot choose which linked accounts will be used and therefore the logged accounts will be used. Since having the same email address does not mean that it is one account, you have the option to link each of the 2 S and 1 P users separately if you wish to do so. And correct, the logged in account will be used for creating content. Regarding all the comments about missing account merge functionality. There is a reason we called this Profile Linking, because this is what it does exactly. To quote myself “This ID situation is much bigger than SCN, and needs to get resolved for all SAP sites and products…We at SAP are working on this. But it will take longer than you would like it to”. I finally got a sensible answer out of SERVICE@SAP.COM as to what the problem was. When i joined SCN there was no choice but to use your “S” number to set up your SCN account. Then, many years later, my company was taken over and we got a new contract with SAP, meaning all our “S” numbers got changed, even though I had not actually changed jobs. That meant my SCN account got de-activated as well, because you cannot log in using a dead “S” number. So I created a new one using a “P” number. After about a year I worked out how to access the SCN using my “P” number and the SAP service marketplace using my “S” number. The latter always tries to log you on using your “P” number. The trick is to use two different browsers, one for the SCN, one for the service marketplace. Naturally I had forgotten the password to my dead “S” based profile, so followed the steps above to ask the various departments at SAP for guidance. They were all over the place, so Gabi was kind enough to link my accounts for me. This morning the mystery was cleared up when SERVICE@SAP.COM explained that my old “S” number account was not only inactive, but actually deleted.Thus it could not be re-activated to reset the password. It all makes sense when put like that. So realistically, if your old SCN account (or accounts) used “S” numbers from some time ago and you cannot remember the passwords it is going to be a bit difficult for you to link your profiles as described above….